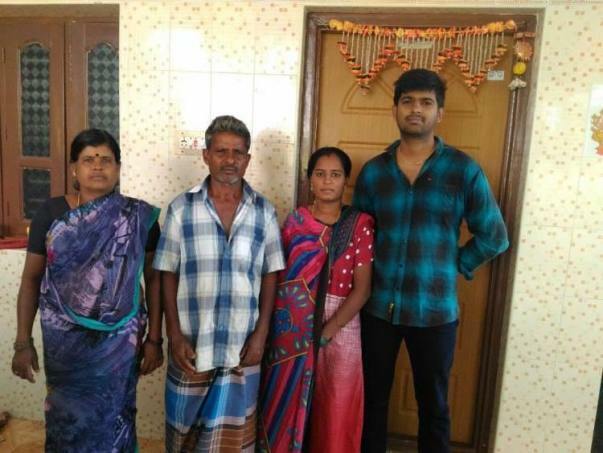 25-year old Santhosh was married last year, even before he and his wife Gowri could start living their dreams and plans, Santhosh was diagnosed with a highly aggressive form of cancer. This has left the couple feeling completely devastated and they are unable to think of their future. Santhosh and Gowri were happily married in June 2017. They never expected for life to turn on them so quickly. 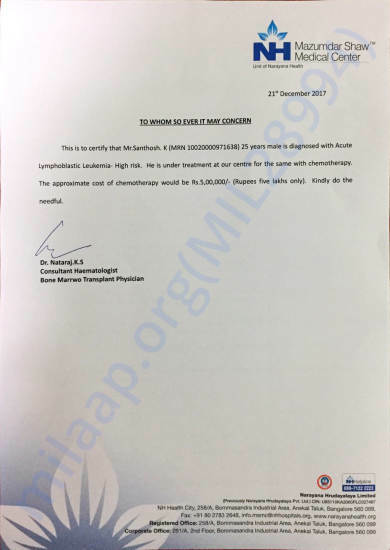 Santhosh was diagnosed with cancer in October 2017. He had completed 3 cycles of intensive chemotherapy and he still needs more. Although this cannot be sustained in the longer term, he needs a bone marrow transplant. Unfortunately, he has no matching donor. Until he finds a matching donor, his life depends on chemo. "I began to feel breathless, really breathless! I had severe body pain and dry cough. I thought I was going to die but the diagnosis was terrible than I thought. I'm dying every day, it is so painful to see my wife suffering because of me. I'm worried about her than my future" says Santhosh. Santhosh is from Dharmapuri, he works in Chennai. He and his wife were living in Chennai until they moved to Hosur. He has to go to the hospital at least 2 days in a week and sometimes he has to be admitted for the chemo. As they don't have any support here, they shifted to his brother's place in Hosur. He hates to be dependant on others, but recognizes that there is no other choice. Gowri's mental strength and determination has surprised everyone. In fact, it is her support that makes Santhosh believe in possibilities for the cure. Gowri is a nursing graduate and she wishes to pursue a job, but the situation doesn't permit her to do. She stays with her husband and takes care of him. "It is so unfortunate that we have to go through this, I'm forcing myself to be strong and not to break down. I don't want him to feel bad for me or for anything. His health is my priority, I'm willing to do anything to save him. He is such a wonderful husband a wife could ask for. At this young age, he is worried only about me and his father and hardly thinks about himself. He deserves a life" says Gowri. 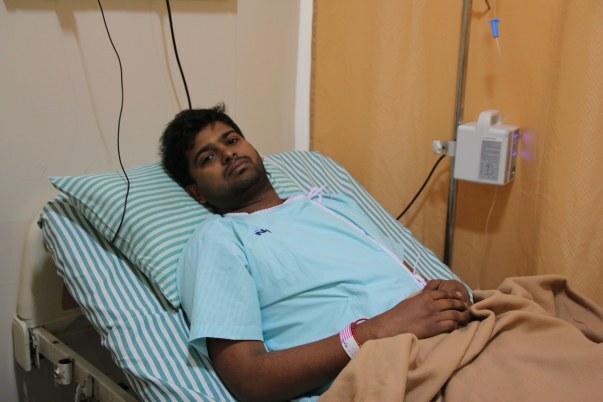 Santhosh's father is a farmer who sold his land to pay for his treatment. 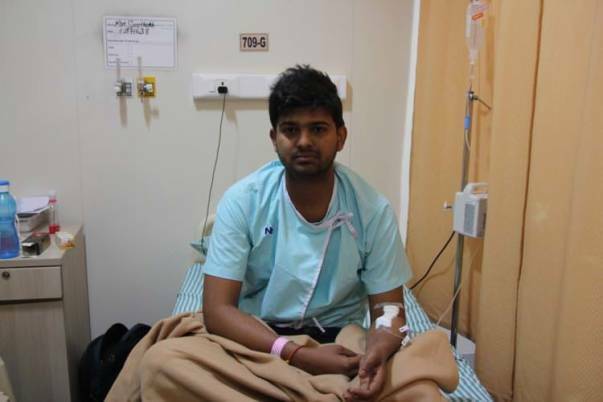 His father and his brother have still not come to terms with the reality, they couldn't believe that Santhosh is battling cancer. He has always been an active, fun-loving and a very kind person. Santhosh and Gowri are hopeful to recover and live a normal life. Santhosh was working for a private company. Having left his job he has no source of income. He managed so far with his savings and the support of his father. Now he has exhausted all his sources and left with nothing. He needs Rs 5 lakhs for the treatment. 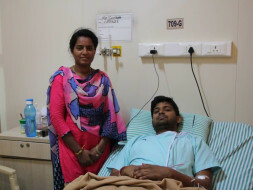 Only your contributions can save his life and help him live a normal life with his wife.